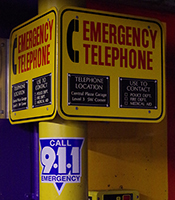 If you have an emergency on the Seattle campus, help can be summoned using a variety of security and emergency phones that will put you directly in touch with the UW Police Department. Officers will respond directly or call other emergency services, such as Seattle Fire and Medic One, if needed. 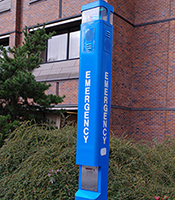 The Seattle campus has a number of emergency phones that are blue or brown. To use the phone, simply press the button and UWPD will be dialed automatically. A blue, flashing light will illuminate to help indicate your location and signal that immediate help is needed. These towers are located throughout campus. Look for locations of these phones on the UW campus map. The blue tower emergency phones are equipped with a public address loudspeaker to broadcast emergency messages on campus. These towers serve as the UW’s outdoor alert system and are one of several different types of emergency communications that can be activated during a crisis. 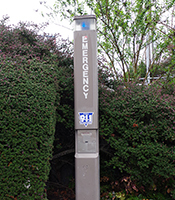 Other outdoor emergency phones are available that have a very different appearance from the blue and brown emergency phones. Most of these phones are located in campus parking garages and are set up to automatically dial UWPD. Many buildings are equipped with two-way phones that communicate directly with elevator-response personnel. 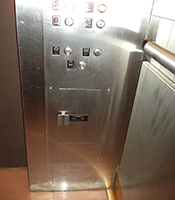 These phones are in most elevator cars and at areas of refuge in some new building stairways. The primary purpose of these phones is to communicate that the elevator has failed and you are trapped or that you have reported to an area of refuge in a building during a building emergency or alarm activation. These phones are very simple to activate and use. The university’s indoor alert system is to notify building occupants of emergencies on campus and is one of several different types of emergency communications that can be activated during a crisis. This is designed to supplement the UW Alert System, which provides text messages to registered phones. Indoor alerts will either be audible or visual. Learn more about the UW Alert System and register your mobile device. Audible messages originating from UW police of the UW Crisis Communications team will be broadcast through fire alarm speakers in most major buildings. First responders (fire and police) will have the ability to override this system locally at each building. 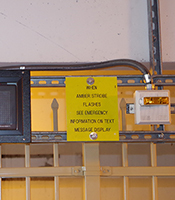 Text reader boards and associated horns are provided in many smaller buildings and garages to alert occupants. A horn will sound and a strobe will flash, indicating an alert has been received. The sign beneath the horn/strobe provides basic instruction. Information provided through the reader board is limited. More information about the incident is often available on the UW website, the Emergency Blog and through text messaging.